Gypsy of the world, hard to catch ! Don’t look for me in the concrete walls..
City life and me are a perfect mismatch . Quieting my breadth with the mystic. Away from the maddening rush. Know that I’m close, probably about to fall! I’ve given my company to the spirits of the jungle. 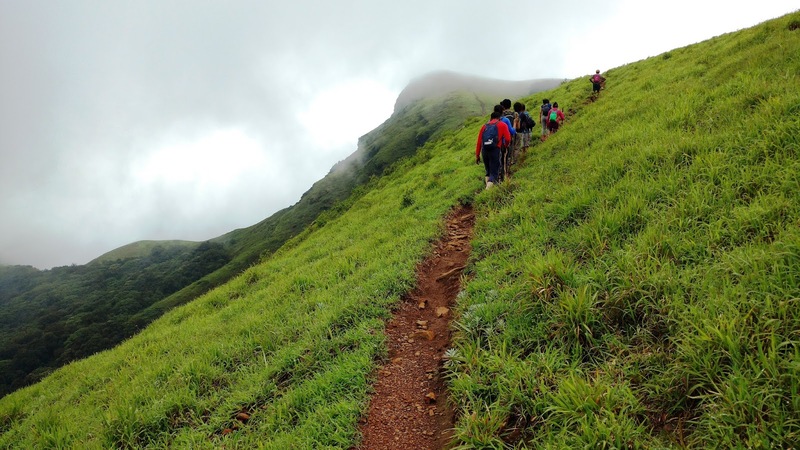 Well ,twenty gypsies headed towards the third highest peak of Karanataka in the western ghats on the 8th of September. 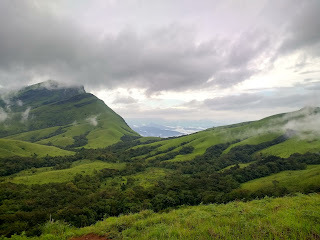 1894 m above sea level Kudremukh is home to a variety of flora and fauna. 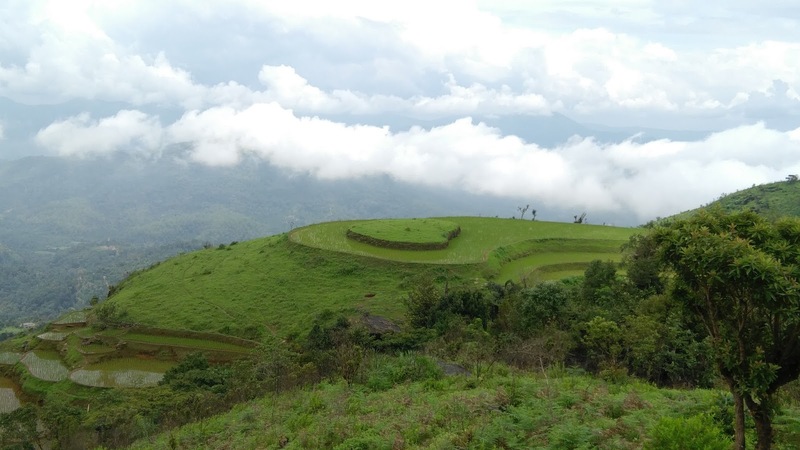 Kudremukha means ‘horse -face’ and refers to a particular view of the mountain. These lush green hills have the capability to enchant even the most experienced trekkers. When the entire city was tired from the incessant rain and was heading towards their home for rescue, twenty BTCians were only eager to start their adventure. We started our journey at 11.00pm on a Friday night from Majestic. With a quick tea break in between we dose off to sleep on our plastic covered new seats, trying not to slip all the time. Waking up in the mystic land, the breathtaking view on the sides had already begun to enchant us. The white mist adding to the magical feel ! We arrived at the base where hot cups of coffee and tea at the local shops warmed us up. Our organizers Gaurav and Monisha informed us about the two options to reach our home stay. We took the route more travelled only by foot as opposed to the jeep. We started our 6km small trek towards the awaiting breakfast we were eager to have! Familiarizing ourselves with each other and our backgrounds the beans began to spill ! Most of us turned to be regular trekkers however our heavy sacks only reminded us of our long journey as trekkers ! Monisha hinted us the task we had undertaken to climb the 3rd highest peak and so this should be a piece of cake! We reached our home stay relieved after an hour of trek. Surrounded by hills on all sides the seclusion was soothing and refreshing. We had just begun soaking in all the green .We threw our bags on the ground and grabbed a cup of coffee. The sound of the nearby falls was very inviting. We freshened up and had our breakfast of rice balls and sambhar. With a quick intro session it was evident how everyone had left their professionals selves to be lost in the wilderness. 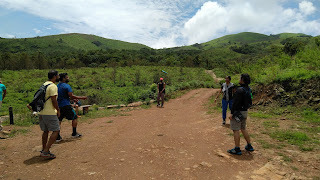 Day one-We started our trek towards Bavikonda peak. At its base lies the Mullodi village. At a lesser altitude than Kudremukh it served as a practice trek for the Sunday trek. It is one of the less explored areas but nonetheless beautiful. With our guide leading us we followed his footsteps. The initial trail was easy but slowly the ascend started. While some were confident to walk, others went on all fours to climb the steep areas. Playing Frisbee in between, we reached our mini stoppage and sat on the logs for some rest. A few houses were visible there surrounded by small farms. Their own sweet world inside the forest. The sun was bright this time and offered us a beautiful view of the nearby hills. After hydrating ourselves we started for the peak again. On reaching the peak we had tamarind rice for lunch and most of us dosed for a quick nap. Whilst others trying to capture the ecstatic view. We were surrounded by mist after sometime which we could see was proceeding towards us for quite sometime. Like a storybook we were captured by the spell and found ourselves dumbstruck by the beauty. After that we started our descend. We returned to our base by about 4:00 pm with love bites from leeches. On reaching the home stay we went for the long awaiting falls. The sound of the gushing water increasing our adrenaline rush. We crossed a small wall which stopped the high flow of water, made probably to prevent super excited humans from drowning! Trying to be extremely meticulous with our steps we reached an opening to the falls. All the stones were covered by a slippery slime making our hearts skip a beat many a times. The boys headed straight for the fall while girls took it slow to adjust by the cold water. Extremely refreshing it soothed our aching legs and we were rejuvenated in seconds. Holding on to each other we tried not be a victim of the strong flow nevertheless a few falls were inescapable. We headed back to our abode content and with empty stomach. We had our refreshments. Each bowl full of pakkoda vanishing into thin air! Light music and games followed thereafter. We settled for a game of UNO. The game becoming intense with each player completing their decks. By the end of it, each one of us took a side of the remaining players. Cheering ,fighting the game ended right on time before world war three! I realized I was the Monica from friends and became picky with game rules ,scolding a few! Then we went for a game of bluff. True colors coming to surface we tried to catch each other’s lies. A fun evening ended and we headed for our dinner. It took us no time to fall asleep thereafter. 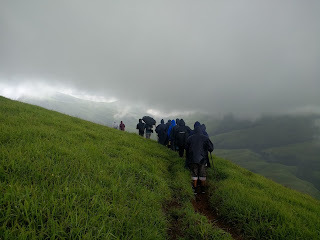 Day two-We filled out bottles with stream water and headed for Kudremukh. A selfie at the forest department office and we were all set. Our first millstone was a large tree which marked the start of our actual journey. From here there was a small trail which leaded us inside the jungles. With hill on one side and a downward fall on the other the way was paved with leaves and fallen twigs from last night’s rain. We reached the first stream and we tip toed trying to avoid water from going inside our shoes. After crossing the jungle we were in the wide open exposing the green carpet in its full beauty for the first time. 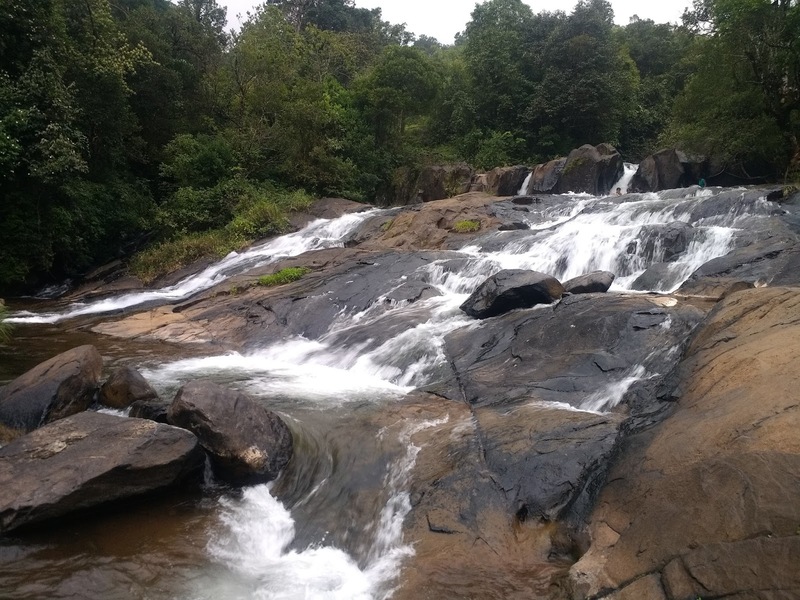 To enjoy this place you definitely need to take advantage of the monsoon season. The entire range was a massive florescent green carpet only folded and with many grooves in between. The valleys were in dark green color housing numerous trees and streams. 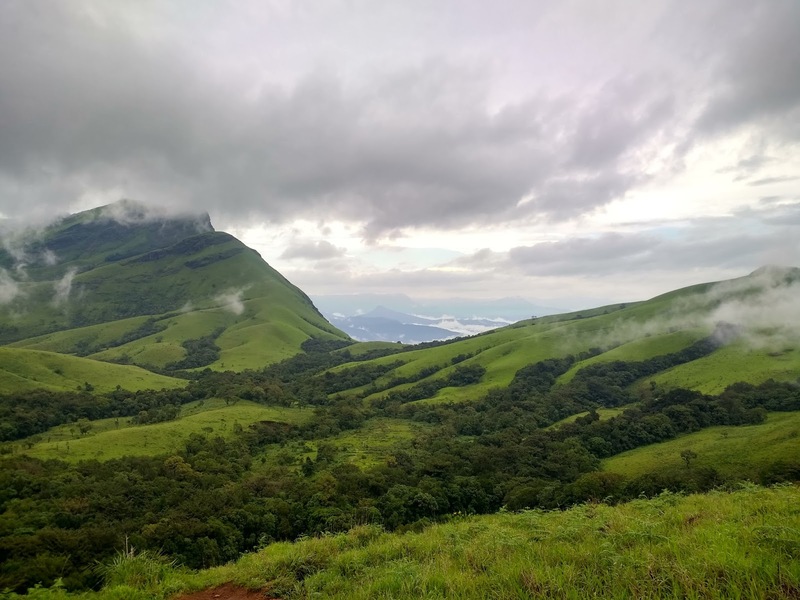 The entire trek is a repetition of getting inside the forest coming out in the green carpet, drinking fresh water from the streams and following the same cycle. We finally came to the place from where we could see the horse like shape of the hill, however each one of us had our own sweet versions! After a long stretch we reached our place of first break. Like a lone ranger in the middle of nowhere this tree stood firm and tall in between the carpet. We took refuge in its company. A quick session of snacks and leech removing session was carried out. We took some more time to appreciate the beauty surrounding us. The place is truly the green carpet not to be missed. It cannot get greener than this. With clouds rising in between the greens it’s like the mountains are high on their own trip! The last stretch of our trek got even steeper. We were still away by about a km to reach our destination. The peak challenging us in every way possible! Not giving in we continued our journey. With every step the mist kept increasing and out tummies made sure we were reminded that they are empty. By this time only few of us cared about the beautiful view we were surrounded and more hell bent on reaching the place. And there it was after a strenuous stretch our peak. With a signboard confirming the same we were relieved, exalted , tired all at the same time! We were quick enough to unpack our boxes and enjoy every morsel of lemon rice .Thereafter a few fruits and biscuits became our sweet dish. We started our descend in the rain, Trying not to fall with each step we took. Maintain the sequence Gaurav the selfie queen ,kept on emphasizing but a few of us gladly kept on shifting. Re-soaking the beauty on our way we reached the great tree again .We decided to rest and take up the mannequin challenge here and made a video. Some great performances came to the surface when replayed! We restarted for our home stay. Now that we were so drenched in rain, we on purpose jumped inside each stream that came our way and Monisha’s work kept increasing. Like a teacher in the kindergarten she helplessly tried convincing us to move forward. By the end of the trek we realized we had left no stream un-bathed and un-jumped. We had no plans of taking a bath for a week for the quota was already complete! A bumpy ride in the jeep and we reached our bus.We had a large feast after the trek completed in the city and ate to our heart’s content. No matter how many times you visit this place, you’ll always find something new yet to be explored. Pictures can only do little justice to what the place actually has to offer. You’d wear your sun tans with great pleasure for a while and leeches shall be a reminder of the sweet memories you created. And though goodbyes are hard, we knew that we’ll see these gypsies soon. It’s hard to contain them for long in one place anyway !